Located on a small, steep hillside section, this new build by Avenue Homes is firmly and reassuringly anchored to the bedrock and yet appears to float like a sailboat on the sea. 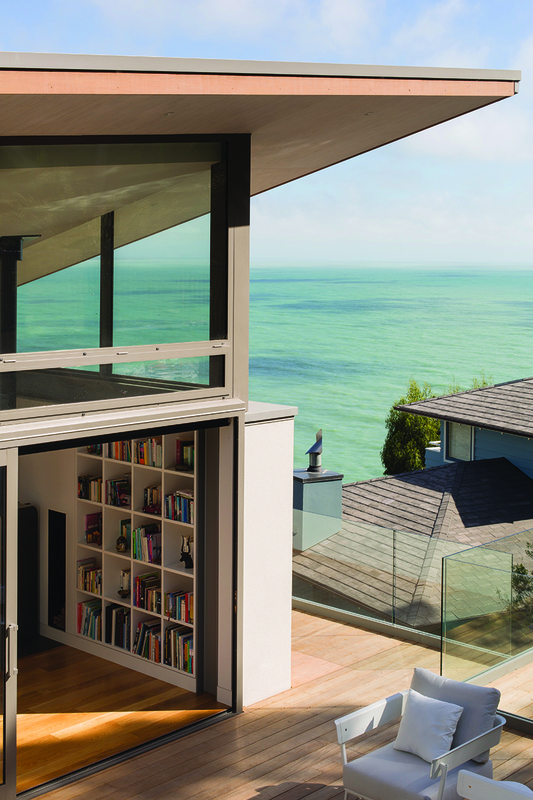 Designed by Borrmeister Architects this modestly scaled, three-bedroom home aimed to connect the openness of Sumner beach with the forested slope of Scarborough Hill. The brief was for a relaxed home, open to the sun, capturing the panoramic views, with shelter from the prevailing winds, and good driveway access and parking. Solar panels, rainwater retention tanks, automated overhead louvres, an ultra-low emission log burner, high-level windows, sliding screens, low maintenance materials and the warped roof, designed to follow the daily sun path, answered the clients’ desire for an environmentally conscious home. It’s these features that really made the build an inspiring project to be part of, says Ben. “It's a really well thought out home that captures the site perfectly.” he says. The roof is clad in Calder Stewart Solar-Rib, a product specifically designed to generate electric power through the use of Photo-Voltaic Laminate (PVL) solar panel technology. There were challenges from the get-go. To tackle this difficult site the 266 square metre house was designed around a strict 1.2m grid resulting in a very simple rectangular footprint, over three levels. Consultant engineers Engco worked closely with Borrmeister Architects and Avenue Homes to address the requirements of this unique site. They drew on their international experience to resolve the complex geometry into efficient and practical structural details while realising cost effective design solutions that met the clients’ vision. The cantilevered stairs, floating roof, branched timber columns and expansive cantilevered decks all required engineering finesse to balance seismic robustness with great architecture. Glass facades mean the upper floors are light-filled and open while sliding cedar screens provide sun control, cross ventilation, cooling and privacy. The internal and external frameless glass balustrades, which maximize the view, are the work of Euroglass who also installed the pool fencing, shower screens and borrowed lights above internal partition walls. Euroglass used Anzio channel system and 12mm toughened safety glass. To meet the challenges around access and steepness they used a spyder crane to enable glass to be installed. The top level comprises an open plan kitchen, dining and lounge area, a snug, small study and a toilet. Three bedrooms – the master with ensuite – a further bathroom and separate toilet, laundry and sauna are on the middle level, while a double garage with storage is in the basement. Generous decks connect the house with the pool, an outdoor shower, vegetable garden, grandstand-like seating area and the uphill park. The lightweight sail-like roof ‘floats’ on two tree-like timber and steel support structures. It is the pièce de résistance and thrills the homeowners who liken it to the twist in a DNA structure. The exterior materials on the first and second floors include Calder Stewart vertical corrugated coloursteel, which has a modern, elegant profile befitting the architecture, and Hebel PowerPanels installed by TK Plastering. They’re fast to build with, perform really well acoustically and provide good thermal insulation, explains Director Tyson Keats. Like all the contractors, Tyson admits the location was a challenge – the team delivered all the materials to site by hand – but this made the outcome all the more rewarding. “It’s really a stunning home”, he says. The ground floor is clad in stone excavated onsite. The homeowners duly admit, “our building site seemed to be rock and nothing else! We decided to use it to encase the basement.” Ben says the grueling excavation took 3–4 months using predominately a Kango hammer. Stonemasons selected rock by hand and incorporated it back into the build. A pared back neutral interior palette complements the home’s natural exterior. Milano Tiling, who have seen a surge in the popularity of tiling in not just bathrooms and kitchens, but in other living areas, supplied and installed large format, lightweight black Laminex Italian tiles in the living room, kitchen and stairwell, cleverly suspending them to echo the aesthetic effect of other architectural features, such as the floating stairs in American white oak. The bathrooms boast clean and contemporary lines with European tiling supplied by Brymac Tiles, including Country Blanco for the walls, which have a soft handmade effect, and Paris Stone Nero and Urban Stone Gris. After 40 years in business the team at Brymac have seen fashion trends come and go but say you can’t go wrong when you install high quality products. 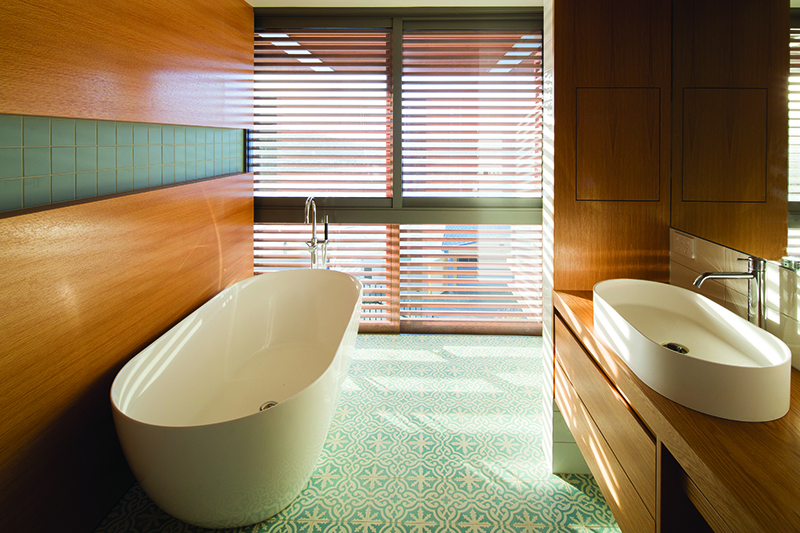 The tiling was completed by ANZ Tiling. Dawood Hussaini and his team work on small and large scale, residential and commercial projects, from the Justice Precinct in Christchurch to the Beehive in Wellington. Dawood says this home demanded the same attention to detail as that required for the marble flooring at Parliament and he’s more than pleased with the outcome. Sharp Electrical wired the home inside and out, from the imported light fixtures, to the swimming pool which is lit and has a swim current generator, to the security alarm and home theatre system, which is controlled via a phone app. Lighting is conveniently sensor operated where appropriate. Sharp worked closely with Avenue Homes to conceal cables on the top floor – an area that is 90% glass and steel. The seamless transitions from inside to out are a remarkable feature of this home. Monarch Aluminium custom made the majority of the aluminium joinery to meet the architect’s design specifications and utlised Planitherm XN high performance Low E double glazing by Viridian Glass. Monarch also supplied and installed APL Metro Series Thermal Heart and APL Architectural Series Sliding Doors by Vantage Windows and Doors and the stunning glass-clad Plasma Door at the main entrance. Avenue Homes has a reputation for exacting standards of craftsmanship, which has earned them Canterbury Registered Master Builders House of the Year Awards and Canterbury Heritage Awards. Yet even with 25 years’ experience in the building industry, specialising in high-end architectural residential builds, Ben admits “this was one of our more challenging builds to date, namely due to the complexity of the site, the finesse of detail and the precision required to achieve the finest of tolerances. Throughout the two-year build the homeowners really trusted in our process,” says Ben. "This trust meant that our team of builders and subcontractors could adapt to the site and find alternative solutions when needed." The vast majority of building materials and hardware products were sourced locally from PlaceMakers Cranford Street, who have a longstanding relationship with Avenue Homes but also cater to the DIYer. Their collaborative approach means they are first port of call for a number of other leading residential building companies in Canterbury and they really understand the different challenges facing contractors. One of the biggest challenges in this build was the 10-ton gross weight restriction for trucks. Ben rented a piece of land on the Esplanade where bigger loads were stored and used smaller trucks to deliver materials to site. All day road closures for earthquake repair work over several weeks during construction further exacerbated access. The homeowners say that Ben did a great job communicating with the Council to gain ongoing site access. And to top it all off, the home is one of 100 to reach Gold Reserve status at regional level of the Registered Master Builders House of the Year Awards taking them to the national competition to be held later this year.